The 4th of July 2018 is here! And many will head out and watch fireworks being blasted off across many places across the county. 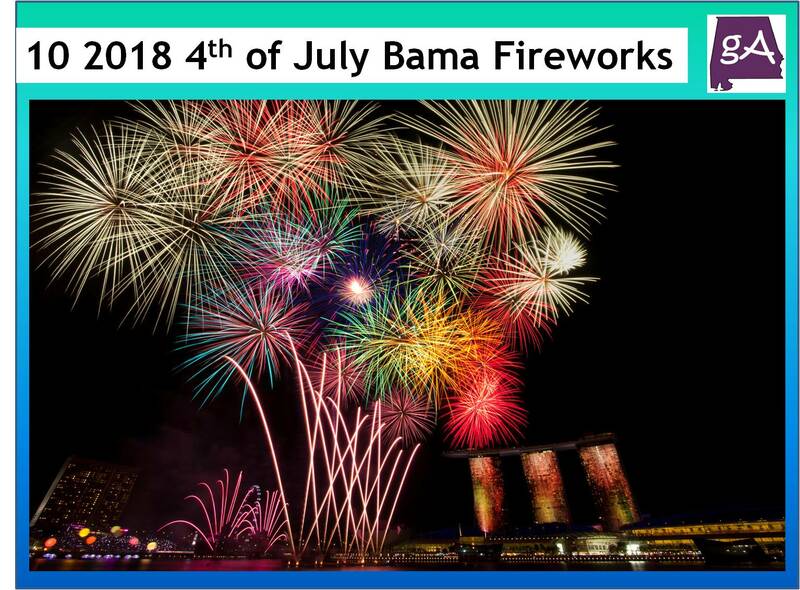 In this post, I am highlighting the ten top firework shows you can see across Alabama, let’s go! Starts at 9 pm. Fireworks synced to music played on many radio stations. Fireworks show will also be on live TV on FOX 6. To see the fireworks, make sure you can see the Vulcan statue on Red Mountain. Also, UAB Summer Band concert at Bartow Arena starting at 7 pm. Fireworks show begins at 9 pm at Point Mallard Park. Fireworks show begins at 9 pm. Watch either at the Lake Martin Amphitheater or on a boat on Lake Martin. Concert starts at 6:30 pm and fireworks starts at 9 pm. Fireworks show begins at 9 pm. Fireworks begins at 9 pm. Fireworks start at 9 pm.